"I was trying to get a buzz," he slurred before closing his eyes and dropping off to sleep again. I had just walked in to an evening shift in the ER and had picked up my first patient of the night. He had come in after taking about five tabs of methadone earlier that morning that he had bought off someone. After ingesting them earlier this morning, he spent the next few hours "falling out" (fainting) about four times at home. Once he had "sobered up," he decided maybe that wasn't normal and he should come and get checked out. We went through all of the usual questions – no, he said he didn't take anything else. No, he wasn't trying to kill himself. No, no other medical issues. He was groggy but conversational, his vitals were normal at the moment, and he wasn't having any acute issues so after we talked and I examined him I left to go find one of the ER attendings to discuss what to do about this guy going forward. Even though he had been using sedating medications, passing out several times and falling at home isn't normal. Also, his EKG (an electrical picture of what his heart was doing for a few seconds) was a little bit abnormal, so he was likely going to buy himself a bit of a workup and likely admission. The night went on. I walked out of another patient's room a little bit later and went to a computer to check on the workup of some of my patients so far and noticed that the methadone guy had been moved to one of the resuscitation rooms. Turns out he had an episode of ventricular tachycardia (a very fast, abnormal heart rhythm) that was caught on the heart monitor in his room. It was short but that's definitely not normal, so he was moved to a room where we could watch him more closely and intervene if needed. Turns out, that was also a good idea. Shortly after his first brief episode of "v-tach," he went into another one – longer this time. He had a pulse but wasn't responding – the heart wasn't able to pump enough blood to the brain. We had already put the defibrillator pads on him, so after he became unresponsive we started charging the machine and delivered the shock. He almost jumped off the stretcher, but immediately he was awake and the monitor was demonstrating a normal heart rhythm again. The attending started a constant infusion of a medication called amiodarone to hopefully keep his heart rhythm normal and we started working to get this guy upstairs to the ICU for further observation and care. Turns out, his heart had other plans. As we were working in his room, he became unresponsive. V-tach again. He had a pulse. Charge, clear, shock, jump, awake. Breathe. Time to get this guy upstairs. We began to wheel him out of his room into the hallway towards the doors to the elevator when he became unresponsive again. Again, he still had a pulse. Charge, back to the room, clear, shock, jump, awake. Breathe. This happened five times in a space of a few minutes. This guy needed to be sedated so we could continue to care for him and shock him if needed. That means we needed to "take his airway," or intubate him – put a long breathing tube down through his mouth, past his vocal cords, and into his lungs. As it happened, the day before we had just had a (timely, it turns out) skills session learning how to intubate, run a code, and use the defibrillator. As we were preparing to intubate him, the attending turned to me and asks, "Have you ever done this before?" "Nope… but we did just practice yesterday." He hands me the blade, a short curved metal instrument with a handle that you insert into the patient's mouth while standing behind their head to sweep the tongue to the side and lift up the soft tissues of the jaw to expose the vocal cords, which hide deep in the throat. "You're up." We run through the pre–intubation checklist (in medicine, as with most things, the most important part of any task is the preparation). Suction. Bag-valve mask at the ready. Oxygen on the patient. Blades. Tubes. Meds. All of the tools we need to place the airway and make sure it's in the right place when we are done. Finally, it's time. He has been paralyzed and is now depending on us to breath for him, which means we have a limited amount of time to get things in place. The day before, we had practiced on plastic mannequins. Their airways were, well, plastic and actually really hard to work with. You have to lift up on the handle of your blade once it's inserted in the mouth to expose the cords, but you have to be careful about how you lift – if you lift the wrong way, you'll break their teeth. With the mannequins, you almost had to lift the disembodied torso off the table to visualize the cords. Human tissue, it turns out, is a lot more pliable. I opened the patient's mouth, inserted the blade (this is the side to put it in on, right? ), swept the tongue aside, and lifted the blade towards the corner of the room, surprised at how easy everything was move out of the way. This is the part where everything falls into place or falls apart. Almost immediately, I could see the floppy epiglottis hanging down, obscuring my view. "Push the blade in just a bit further." I eased the tip of the blade in just a bit further behind the epiglottis, lifted up just a bit more… and there they were. Beautiful pearly white cords. I held out my hand and someone handed the endotracheal tube to me. They tell you that, once you see the cords, you should never look away – you don't want to risk losing them. I inserted the tube into his mouth, guided it towards his glottis, and was relieved to see the tube passing easily through the cords. My job was over for now – I removed the blade, we secured the tube, and began taking care of all the other tasks that need to happen once someone is unconscious and depending on a team of strangers to help them breathe. That night was probably one of the more memorable moments of my month in emergency medicine and certainly embodies some of the reasons why I personally think the specialty is one of the best jobs in medicine, but it certainly isn't how the whole month went. Every other shift was filled with hours of seemingly more mundane encounters – sorting through which chest pain patient might actually be having a heart attack, which belly pain patient was actually having an abdominal emergency, helping patients who came in short of breath to rest a bit easier, and figuring out which kids were potentially sick or not. Not all of it was fit for prime time TV, but I thought it was one of the best months of medical school. It was very different than all of the rest of my third year rotations. The pace, the patients, the focus – it was a huge paradigm shift from working on the floors or in clinic. In the ER, you had to move fast or drown in the sea of patients waiting just outside the double doors in the waiting room. While upstairs I might have had the opportunity to spend an eternity chart reviewing a new patient, poking through their old medical records, and even writing most of my note before I even had to go see them, when I was in the emergency department I was lucky to see their initial vitals and a triage note before I walked into the room. You had to think on your feet and form your differential diagnoses at the bedside and walk out of the room after a brief encounter with at least an initial plan of action. One of the doctors, on my first shift, spent a few minutes giving me and another student a few pointers before sending us off to see patients. "In the ER," he said, "you don't have time to think. Don't think. Just do. You have to do your thinking outside of the ER." And for the most part, that proved to be true. If there was something I didn't know about on the floors, it wasn't unusual for me to have some time, at least in the afternoon, to sit down and read about a topic for a few minutes. That wasn't typically the case here – if I needed to look something up before presenting a patient, I had maybe a couple of minutes tops before I would start running behind. You really had to spend time off of your shift thinking through how you would react in the first few minutes of any given patient encounter, what your initial actions would be, what questions you'd ask, what physical exam portions you'd emphasize, what your top differential diagnoses would be, and how you'd go about working that patient up, if at all. We spent about half of our shifts over the course of the month working at Loyola and the other half working at a community hospital nearby. Personally, I actually really enjoyed the community shifts more – at Loyola, a large tertiary care center, there was a "team" for everything (strokes, heart attacks, trauma, etc.) and a separate pediatrics section. So while we stayed plenty busy, it seemed like everyone had their hand in the pot. At the community center, it was you, a couple of other docs, and the waiting room. You saw all the patients, did most everything that needed doing, and functioned like you'd imagine an emergency medicine physician would. "Practicing emergency medicine is like carefully lining up a putt, then dropping the putter, picking up a tennis racket to return a volley or two, quickly side–stepping an onrushing tackler, and then returning to sink the putt." Another doctor/writer said that "Emergency Medicine is the most interesting 15 minutes of every other specialty." Essentially, it's perfect for someone like myself who enjoys most aspects of medicine in general and really doesn't have an interest in spending the rest of my career focusing on a limited number of medical conditions. That said, EM provides plenty of opportunities to become a "master" at whatever particular bit of medicine you find more interesting than the rest – for example, sports medicine, toxicology, emergency cardiology, resuscitation, and so on. I've been interested in EM since before medical school. In fact, it's what got me interested in medicine in the first place. Going through medical school, I've tried to put it on the backburner, keep an open mind, and explore other fields, but nothing else really sticks out to me like this one. When I picture being a "doctor," I've always pictured someone who could handle just about anything. There are few fields that fit that description, but I think EM is one of the best at meeting that criteria. Obviously no field does everything. Medicine is a team sport and every field has its limits, EM included. One interesting thing about EM is that it is practiced in bit of a fish bowel – that is, everyone is watching. All the hospital staff who take over on the patient you admitted for whatever reason can see everything you've done so far in that patient's care and workup. And at least at academic centers, and especially in residents, it's sometimes en vogue to make fun of something that was done during the patient's stay in the ED. It seems to be less of an issue with actual attendings or in community settings, but it's just an interesting phenomenon I've noticed. What's often overlooked is that the same Monday-morning quarterbacking is often done from the comfort of a small, quiet room somewhere tucked away in the hospital with the benefit of 1) more time (the best diagnostician, by far) and 2) more complete information (in part because of the workup that is currently being mocked). Sure, we know the patient's not having a heart attack now, the morning after they were admitted. But that's something you only can tell using your trusty “retrospectoscope,” which unfortunately wasn't available to the ED physician at 1 am last night. Additionally, the practice of EM can be radically different than the practice of medicine on the floors – less information, higher stakes, faster paced. Sometimes that means maybe an extra test or two were ordered in the interest of time, or maybe some treatment was initiated that technically could have waited, but that's the game. Finally, what they may sometimes forget is that for every admission, veritable hordes of patients were seen, treated, and “street-ed” from the ED. If you're interested in EM, just be aware that there are those with very vocal opinions about the field (and often other fields as well). I would just say to smile and nod and realize 1) they honestly have no idea what they're talking about. It's not their fault; they just don't know how things work in the ER. And 2) I've noticed that oftentimes the loudest critics (whether of EM or any other field) seem to be trying really hard to convince themselves that they chose the right field for themselves. If you want to learn the pros and cons of the field, talk to an actual ER doctor. So there's that. Just play along, keep a thick skin, and don't lose sight of what's important – that is, choosing the right field for you, not your burned–out resident. Speaking of burnout, that's another concern that's commonly voiced about emergency medicine. More than likely, it's a valid concern for a lot reasons – the shift work can be brutal (especially as you get older), the actual practice can vary a lot depending on what environment you are in, the pace can be soul–crushing, etc. But if you look at some of the burnout data from the Medscape surveys, burnout is really an issue with medicine in general, not just EM. And while EM can be found near the top of lots of the charts related to the prevalence of burnout in various fields, you'll notice that the difference between EM and the next ten fields is pretty minimal (a few percentage points). What's also interesting is that while the prevalence of burnout in EM may be a little bit higher than other fields, the severity of that burnout is lower (even that that of, for example, family medicine, a number of surgical fields, and even internal medicine). The problem isn't so much with EM as it is with medicine in general – the landscape of medical practice is shifting and more and more is being expected of doctors as it relates to metrics and paperwork in addition to good old patient care, which is what we all – presumably – went into the field for in the first place. Preventing burnout is a topic unto itself and has a lot written about it by people smarter than myself, but suffice it to say that there are things we can do to minimize the risk of burning out. For example, keeping your priorities straight (e.g. decreasing shifts at the expense of some income), keeping yourself healthy, quickly doing away with your medical school debt and setting yourself on the path to achieving financial independence so you aren't chained to your job, and making room for a Plan B (e.g. a fellowship into a different niche of medicine or perhaps a different career path entirely) are all good places to start. Ultimately, finding the specialty that's right for you can be a bit of a journey. You might have one in mind at the beginning of medical school. Or not. You might end up sticking with that specialty. Or not. You might bounce back and forth between several seemingly unrelated specialties throughout third year and maybe even into the beginning of your fourth year when you absolutely have to choose (or just go into internal medicine to defer the choice for another three years… I kid, I kid). For me, though, I'm excited to begin the residency application process for emergency medicine and looking forward to what the future holds. Third year is officially over now, which means I’ve completed three more rotations without posting anything more on the blog. Which means it’s time to sit down and write something. I’ll try and briefly cover my internal medicine and neurology rotations in this post, and then emergency medicine (my last rotation of the year) will get its own post. Together with surgery, the internal medicine (or simply “medicine,” as it’s more frequently called) rotation forms the latter half of the third year gauntlet through which we all must pass. Ideally, after completing these rotations, one is expected to have a very rough idea of the expanse of medicine and at least a general idea of what they may want to do when they grow up. That may or may not be the case in actuality, but that’s another post entirely. My medicine rotation was eight weeks long. The first half the rotation took place on the “wards” or “floors” at Loyola and the second half was at the VA hospital immediately next door (or at least a long walk away). The hours were fairly typical hospital hours but significantly better than surgery – we were there at 6 am to get sign out from the overnight team and, depending on which site we were at, how busy the day was, and whether or not our team was admitting new patients, would get out between 4 – 5:30 pm. The one weekend day we had to work was shorter – we’d usually be done by noon, sometimes a little later, sometimes sooner. Most of the work happened in the morning. We’d get in, hear about any overnight events for our patients, round on them, and see any new admissions we knew about already. Depending on the morning, we might have a meeting or lecture, and if we were lucky we’d have a few minutes to touch base with our residents to talk about our plans before we rounded with the attending. Some of the attendings like to sit down talk through the patients first and then go see them (this was ideal, I thought, and typically a bit more efficient), while others liked to do bedside rounds. Either way, this process could take anywhere from an hour and a half on a good day to three hours or more on a… less good day. Once that was over, the rest of the day was spent seeing any more new patients that were admitted, writing notes, following up on consults, or whatever busywork was left over. Each day was fairly routine. The medicine itself was sort of the “bread and butter” of hospital medicine. This was the biggest service in the hospital and accounted for the vast majority of the inpatients. Day-to-day work usually involved tweaking medications to achieve the desired result and seeing what happened or waiting on labs, imaging, or other workups while we were trying to get at a diagnosis. There was something nice about the predictableness of everything – there was a certain way everything was done and certain time to do everything. While it was busy at times, this was the service, more than any other (except for perhaps neurology), where our attendings loved to sit and discuss what was going on and what odd things might be (but probably weren’t) contributing to our patients’ current problems. This was also the first rotation for a long time where I didn’t have some form of clinic – everything was on the floors. Since this is one of the third year “gauntlet” rotations, it was busy and when it came to studying I had to pick and choose which resources I actually could use. As usual, I started out the rotation with grand plans of getting through Step Up to Medicine, all of the UWorld medicine questions, and reading about individual patients. As it turned out, Step Up just put me to sleep after a long day on the wards and I didn’t have the time to get through even half of all my original goals as it was, so about three weeks in I just switched to reading about different patient problems on UptoDate and doing as many UWorld questions as I could (ended up getting through around half of them). That said, since I had had surgery first, that seemed to be sufficient to do well enough on the end of rotation shelf. As with most rotations, I enjoyed medicine. I already know I wanted to practice the “breadth” of medicine, and general medicine certainly fits the bill. Also, doing an internal medicine residency is a fairly safe bet – this is the path you need to go down anyway to “unlock” many of the fellowships into medical subspecialties (think cardiology, gastroenterology, rheumatology, critical care, etc.). That being said… I am not a fan of rounding. There are certainly ways to make it less painful, but sitting around talking about patients for hours every day just isn’t my idea of a good time. I like seeing patients and doing things for them, but that only comprised a small portion of my day. The rest was spent mostly on the phone calling consults or on the computer chart reviewing or writing notes. Stuff that needed to be done, sure, and not exactly unique to medicine (emergency medicine certainly has more than its fair share of phone and computer time too), but that was all. day. long. I did appreciate the intellectual aspect of the field – medicine people like to sit around and talk about the endless possible etiologies or sequelae of a given disease process. And that’s not a bad thing – I enjoy learning or refreshing my memory about a given disease process as much as the next guy, and many of the residents and attendings I had the privilege of working with were incredibly intelligent and had a lot to teach (some, not so much, but hey – that’s life). Of course, all of this isn’t necessarily reflective of what one’s day-to-day would look like in one of the many possible subspecialties, but that’s a conversation for later. All in all, I feel like this is the field I might fall into if EM didn’t exist and I decided to not go down the family medicine path. I might consider doing a combined medicine-pediatrics residency if that were the case, though, because I really do enjoy seeing kids – not something you get to really do with a run of the mill IM residency. Once I crested the hill of the third year, fourth year and its fruits were in sight. My first taste was with neurology – a four week rotation that, by some odd design, was almost more “shadowing” than actual work. With medicine and surgery and most other third year rotations so far, I had been busy working as part of the team, seeing patients, and increasing my workload as much as I could (or at least pretending to do all of that, even if what we were doing wasn’t all that important). With neurology, things were a bit different. First off, instead of having maybe one or two other medical students on your team, there were five of us, which made for a bit of a different dynamic. Second, the residents weren’t quite sure what to do with us. Finally, we had all just made it through the hardest part of third year and were ok with relaxing at least a little bit. Regardless, there were no weekends with this rotation, which was beautiful, and we typically didn’t need to get to the hospital until 7 – 7:30 am, which was also beautiful. To top it off, the residents started looking at us funny if we were there past 4 pm, and often sent us home closer to 3 pm or so. This must be why all the fourth years look so happy. We spent two weeks of the rotation on “wards,” or the neurology inpatient service, and two weeks on the neurology consult service with some clinic smattered in there once a week or so (which was actually one of the more useful parts of the rotation where I actually got to practice my neuro exam a bit and get some one on one time with an attending). I will say that most of the residents and a couple of the attendings (well, one) did try to take some time out of their day to teach us some useful things (reading MRIs, managing seizures, etc.) which is always helpful and appreciated by students. Most of our patients were either on the floors or in the neuro ICU after having a stroke, being worked up for seizures, or having some other assorted neurological condition (multiple sclerosis flare, intractable migraines, etc.). This, above all else, is the rotation where people loved to stand around and talk about exactly what part of the central or peripheral nervous system was probably affected by some lesion, and then order or look at imaging or some other study where possible to confirm it. Unfortunately, unless you were an interventional neurologist (a fellowship that allows you to go in and pull out clots within a certain timeframe after a stroke), it felt like most of our energy was spent figuring out what was going on and then watching and waiting to see what happened. There were exceptions, of course, and obviously there are important things that need to be done or medications that need to be started to reduce the risk, for example, of having a future stroke or seizure, but overall I felt like time was the most important treatment for many things (“Oh, you had a stroke? Well, we have a clot-busting drug that may or may not actually work, depending on how long ago the stroke was and if you believe the industry-funded literature or not, and might cause harm, but we can try that. And then we’ll start some meds to hopefully prevent this from happening again, and see if time and physical therapy might fix some of your new deficits. Thanks bye.”). This isn’t to bash neurology – it’s an incredible field with many new developments coming down the pipeline, and many of its practitioners are incredibly intelligent with an amazing grasp of neurological anatomy and pathophysiology. Again, though, I found myself missing the “rest” of medicine. I brushed up on my neuro exam, but I think I might have used my stethoscope maybe a handful of times the entire rotation. Overall, it’s not for me but I really do think it’s a great field with a lot of opportunities and some cool fellowships (for example, interventional neurology or movement disorders, where you really can change people’s – with Parkinson’s, for example – lives for the better). Figuring out what you want to do when you grow up is hard, and it doesn’t stop once you figure out “Hey, being a doctor seems like a good idea.” Then you have to sort out which niche in the house of medicine is the one you want to spend the rest (or at least most) of your career in. Thankfully, there are enough different paths in the broad world of medicine for almost everyone to find something they can at least tolerate. It’s generally a good sign if you get through your preclinical years and especially your third year feeling like you enjoyed most things – if you’ve hated every day of your life up until this point, all hope isn’t lost but you may have to work a bit harder to seek out your field. There are a lot of things we don’t get exposed to in our core rotations, and a number of fields that we may not see in our entire medical school experience unless we actively seek them out. AAMC’s Careers in Medicine website is a good resource for exploring many of the possible branching paths in medicine that may be a helpful place to start. Many people start with the “medicine vs. surgery” decision, and that’s a good place to begin. Another way to think about things is to consider if you want to be "the expert" in a particular field (e.g. a heavily subspecialized IM or surgical field). The downside to that is you spend your days doing just that. 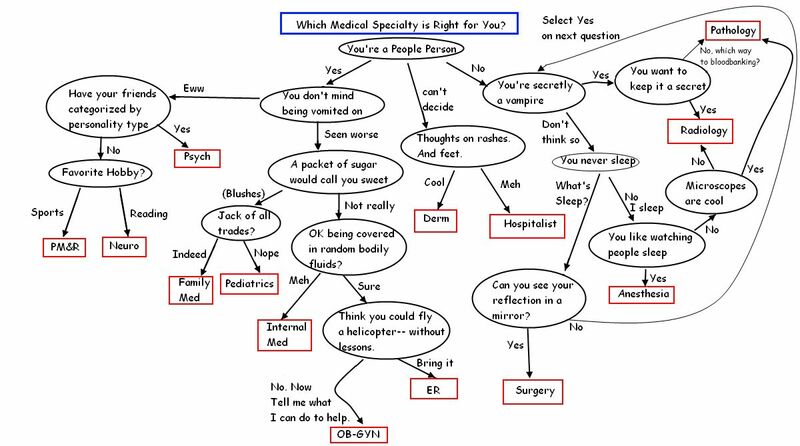 Or would you rather be comfortable with and deal with a lot of different things on a day to day basis (family medicine, general IM, med/peds, EM)? The downside there is you may be good at certain things (e.g. with family medicine - taking care of the “whole person,” etc. ; in EM, you're an expert in working up an undifferentiated patient, managing every field's emergencies, etc.) but won't necessarily function at the level of an "expert" in whatever field you happen to be dabbling in that day. Do you want your life to be all or mostly medicine (e.g. 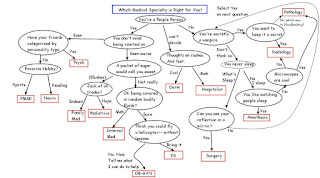 a surgical field or some procedural-heavy medicine subspecialties) or do you want to do things outside of medicine (e.g. 9-5 office based practice, etc.)? And again, there's also lots of nooks and crannies in medicine that you don't really get exposed to until much later in school, if at all. Also, (almost) every field has its “action hero” moments, but most of your time on a day-to-day basis will be bread-and-butter cases. It’s important to differentiate between the two and not pick a field with few-and-far-between “action hero” moments that you love but a daily grind that you hate. You need to find something that you can at least tolerate on a day-to-day basis or you’re going to hate life and burnout quickly. Using emergency medicine as an example, you get to do some cool stuff – run codes, intubate patients, maybe bring people back to life, do some awesome procedures, and maybe save some lives. But most every day, your shift will involve endless waves of chest pains that aren’t heart attacks, belly pains that aren’t emergencies, and the drunks who consume time and resources you don’t have. If you can’t do the grind, don’t do the field. The “awesome saves” in EM certainly aren’t happening every shift or even every month. But we can talk more about EM in the next post. Bottom line: keep an open mind. Explore things. Talk to people. Try and arrange rotations or at least shadowing experiences in fields that you are interested in. Understand that you likely would be happy in more than one field. Don’t feel pressured to choose a field right when you start medical school, or even when you’re halfway through third year. Maybe start feeling a little pressure once fourth year is about to start, but beyond that… take your time finding your field, and choose it for you, not based on any expectations that you think your friends or family have. Don’t choose a field to impress, choose one that you truly enjoy. And regardless of what you choose… maybe think about a Plan B, just in case. That’s life, sometimes. The unrelenting wail of my pager cut through the heaviness of my dreamless sleep. I opened my eyes and fumbled to turn it off before it woke the person trying to sleep a couple of bunks over from me in the call room. It was a text page. "Come to CT in the ED." It was almost 1 am on a Friday night. I was on trauma call at Loyola at the end of my third of eight weeks on my surgery rotation. For the first half of the rotation, my days had been spent on the vascular surgery service at the nearby VA hospital. The days were long - I usually was there around 4:30 am to prepare the patient list, round on my post-operative patients, and write my notes before rounding again with the team around 6 am or so. After rounding, our usual two or three cases would keep us in the OR from anytime until noon on a short day to 4 pm or later on a longer one. After a few hours of taking care of miscellaneous tasks throughout the hospital, seeing consults, attending lectures, and checking on our patients in the afternoon I was usually able to finally leave the hospital anywhere from 5 pm on a good day to 8 pm or so on a longer one. When I came home, I was pulled between needing to read up on the next day's cases, trying to get some general studying in for our surgery shelf exam at the end of the rotation, preparing any presentations that I had been asked to give, taking care of what felt like a million different miscellaneous things that needed to be squared away before fourth year and residency applications began, and – most importantly – spending as much time as possible with my wife and son. Sleeping was usually on the list in there somewhere, too. After a few weeks on that merry-go-round, I was exhausted. During the days, it was difficult to find time to eat, drink, or use the bathroom. When I finally got home at the end of the day, I really just wanted to sit down with my family in front of the electric heater in our living room – the older house we are renting doesn't stay very warm when it is in the single digits outside – and just relax with them, chase my son around the house, and spend time with my wife. But there was no going home tonight. Fridays were busy days anyway at the VA. In the mornings, we rounded as usual and then went to several hours of conference. After taking care of any miscellaneous tasks on the floors, we then went to clinic. Technically, it was scheduled for three hours. But since they routinely tried to squeeze in 40-45 patients in that time span, it was something we all dreaded each week. The clinic was always ridiculously crazy and fast-paced, and by the time we were getting to the end of the afternoon – several hours behind schedule at that point – the patients were almost all (understandably) peeved about having to wait so long. Of course, that made things even more enjoyable. Once the patients were all seen, we would breathe a sigh of relief and start writing our notes – which would usually take up the next couple hours – and finishing up things on the floors for the day. After that, we finally would go home. Tonight, though, was different. After finishing clinic, but before getting a chance to write my notes for that day, I headed over to Loyola to start my overnight trauma call. After meeting up with my resident for the night, we spent the next few hours seeing random consults and admissions throughout the hospital. Finally, around 9 or 10 pm, things started to slow down a bit. I went to the call room to try get a little bit of studying in, but that didn’t last long. I quickly fell into a deep, empty sleep. That, apparently, wasn't how I was going to spend the rest of the night. After I found my shoes, threw on my white coat, and tried to quietly fumble my way out of the call room, I headed downstairs to the emergency department and found the imaging room. A small group was huddled around the screens displaying images that were just being taken of the patient lying on the table in the CT machine beyond the glass pane. They weren't very promising images, either. The story we initially heard was that a teenager was found by friends after he had slipped on ice and hit his head. We'll call him Peter. EMS arrived about 15 minutes later and he was brought to the ED, where he was intubated and sedated since he had a significantly decreased level of consciousness and was agitated on arrival. The images we saw, though, suggested someone wasn't telling the whole story. This kid had two different skull fractures and bleeding all throughout the brain. His brain was swelling in response to the injury and essentially trying to escape through the hole in the bottom of the cranial vault and his pupils were fixed and dilated – a very bad sign of neurological injury. Had this been anyone else – anyone other than a young kid - it more than likely would have been deemed that any significant intervention wouldn't change the prognosis, which was very poor. Since Peter was younger, though, they had to at least try. Nevertheless, the odds of him surviving were grim. After some further imaging, neurosurgery placed an external ventricular drain – basically something that amounts to a catheter inserted through a hole they drill in the skull to drain some of the fluid that normally circulates throughout the brain to reduce intracranial pressures. If the increased pressures continued, they would kill him. Normally when the drain is inserted, the clear fluid normally dribbles out the end of the catheter. In his case, though, the fluid was spurting out the end of it like water does when you put your finger over the end of a hose. Not a good sign. Around this time, the family was starting to trickle in. We eventually learned from one of Peter's friends that he had actually hopped on top of the hood of a slow-moving car that the friend was driving. The friend was startled and quickly hit the brakes, throwing Peter off of the hood of the car and to the ground, where he hit his head. Soon after the drain was inserted, the patient went back to the OR. There, the neurosurgeons essentially lifted up the left half of his scalp from his skull and then removed the exposed portion of the skull – the entire left side of his head. The whole time, the brain seemed like it was trying the escape the room. When they finally cut through the dura mater – a thick covering over the brain that normally protects and encloses it – it finally was allowed to swell without compressing itself on the inside of the skull. By the time they got to this point, I was around maybe hour 25 or 26 of my shift. I was exhausted. Not only had the preceding week been incredibly busy and sleep been scarce, but I knew I still had at least a couple of hours of work ahead of me – before I left, I needed to go back to the VA to wrap up my notes from the prior day. All throughout medical school, we had been warned about various studies demonstrating a decrease in the measured "humanity" or empathy of students that has been observed from when they start their first year as compared to when they finish. The steepest drop often happens in third year. So far, I felt like this hadn't been really been an issue. I've enjoyed most of my rotations so far, I've enjoyed my patients, and I've had a good time overall. I've even really enjoyed my surgery rotation. Taking part in patient care, being a part of the medical team, and learning "real medicine" has been very satisfying. Tonight, though, was different. Tonight, as I was standing near the head of the bed, watching this young kid fight a losing battle for his life… I realized something. That wasn't entirely true. There was a small part of me, deep down, that was breaking for Peter and his family. We've all done stupid things before, but now this young man was paying for it with his life. But there was a bigger part of me, a more immediate and present part, that didn't feel any of that. A part of me that just wanted to go finish my notes and go to sleep for the next week. I could easily explain this away as a bad day on my part. I could say that I was just exhausted, and that things would be better after a day off and decent night's sleep. And maybe all that is true. But the fact remained that I found myself that night experiencing something I never really thought I would – a distinct, undeniable feeling of indifference for a patient. Something that I would sometimes see in residents or attendings who were further down the road and swear to myself that I'd never become like that. Peter survived the surgery and was transferred to the pediatric ICU, where he remained for almost a week in critical condition. His family slept at the hospital, staying at his bedside as much as they could. Pastoral care and social workers did their best to help the family manage their feelings and help them with all of the little things that need to be addressed when a loved one is critically ill. Peter's intracranial pressures actually slowly began to improve, but he then began to require mechanical ventilation to breath adequately. His hospital course was complicated by one of his lungs collapsing, a lung infection, a deadly respiratory distress syndrome that sometimes occurs after trauma, and eventually progressively worsening blood pressures. Finally, late in the afternoon on what would be his last day in the hospital, Peter's status was continuing to worsen. After one final flurry of a failed resuscitation attempt, his father decided that it was time. One more round of drugs was given in a futile attempt to prolong his life until another family member could arrive, but Peter died around 6:30 pm that evening before they got to the hospital. Several weeks later, I'm now nearing the end of my surgical rotation. After the end of the fourth week, we switched services and I was assigned to surgical oncology. This has been another busy service with some very sick patients, not all of whom have survived the surgeries that were meant to be a last attempt at a cure. Some of those who have survived still don't have long to live – maybe a couple of years at best. I'm still tired. That seems to be a defining feature of this rotation and probably won't go away with the next one. But my experience that night at Peter's bedside has stuck with me. It taught me how easy it is to lose the "bright-eyed and bushy tailed" optimism that so many of us start third year with and gave me a little more understanding for those weary residents and attendings who, from my relatively rested point of view as a medical student, were maybe a bit shorter or seemingly uncaring with patients than I would like to think I would be. But for all I know, perhaps I'd be even worse if I was in their shoes. I hope not. To you, the reader, perhaps this all seems a bit silly and blown out of proportion. And perhaps you're not wrong. For my own part, though, my hope is that this experience serves as a reminder going forward to continue to reflect on my "spirit" as a medical professional and ensure that it doesn't get beaten down by the rigors of the path to come. So will I go into surgery? Probably not. That being said, I really did enjoy the rotation. I think I would be happy in a surgical field, but then I’d be happy in most fields of medicine. There’s definitely an important distinction to be made between being satisfied with your career and being satisfied with your life in general – notably, the former doesn’t necessarily beget the latter. I really enjoyed a lot of things about this rotation. I enjoy working with my hands. I enjoyed the (mostly) definitive fixes that we were able to offer patients most of the time. I would imagine that being the person who reached inside someone and fixed them is an immensely satisfying thing. I also hated the rest of my life during this rotation. Most everyone that I worked with seemed to not enjoy (or, perhaps more accurately – not be able to enjoy) their life outside of the hospital. I’m all for working hard, and there’s a small part of me that would go into surgery just because I like to do hard things. But most of those who go into surgery seem to have a rather unique mentality – the training demands that those who would wield the scalpel not only be willing to work themselves to the bone but enjoy doing so, and then come back and ask for more. 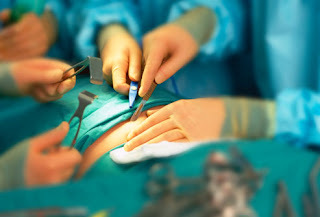 It demands that those who aspire to be a surgeon give everything that they have to that end. It demands that surgery be the most important thing in their life, regardless of the cost to everything else they might value. At least, that’s what it seems to take to be a “good” surgeon. And while all of that sounds noble and good, it has a not-so-subtle dark side. No. That’s not fine. At least not for me. Being a good doctor is important to me. It’s an incredible profession that demands a lot of its trainees, regardless of what field they go into – and rightly so. I’m more than willing to work hard. But there’s more to life that being the “best doctor ever” or proving to your colleagues that you can take endless amounts of abuse. I value my future career, but I also value being a good husband and father, one who can be present in and participate in my family’s lives. I have interests outside of medicine that are important to me as well. There are certainly those who balance a surgical field with all of the above and do it well. But there are very real costs to such a path that need to be counted before one enters onto it. Particularly when you are entering a field where certain residency programs used to actually boast of divorce rates greater than 100%, you have to understand that you are fighting the tide when it comes to maintaining a healthy family life during your training. Sure, residency and fellowships are temporary, but that’s still five, six, seven years of your life. And most of the attendings that I worked with didn’t seem to slow down much themselves. One piece of advice I’ve heard is, if you’re thinking about going into a field, try and identify someone in that field who is living the life you hope to live when you get to where they are. If you can’t find that person, it probably is for a good reason. For me, I was just trying to find someone who was able to spend enough time with his or her family. I had the opportunity to work with a pretty large number of attendings, but most of them either 1) had very young families (i.e. didn’t start a family until after most or all of their training was done and they were established in their career) 2) were single 3) saw their families “enough” for them (e.g. “I saw my kid once this week – that’s enough for me”) or 4) seemed like they were always working and bemoaning not being able to make it home for planned events or whatever. Some people get into the OR and feel that they’ve found their home. That wasn’t my experience. As I said, I certainly enjoyed it. But I won’t really miss it all that much. And therein lies the important decision point – if surgery turned out to be “the one thing” in medicine that I truly enjoyed, then we would consider starting down that path. It would be difficult, but we would without a doubt come out the other side stronger for it. But the stuff that doesn’t kill you, while it makes you stronger, also leaves scars. Those scars can run deep, and at least for me and my family, they aren’t worth it. I guess I’m writing all of this because I really had to think quite a bit about what I was hoping to get out of medicine and life in general during this rotation. There were a number of times where, after having the opportunity to do something “cool” or see some incredible anatomy that I could peer into the future and see myself doing this. But there were also plenty of times where I missed out on some special moment with my son or some quality time with my wife because I was at the hospital during all hours of the day (or night), and when I was at home I was exhausted and not truly there. As I said, to some degree that’s just part of medical school and residency in general, and those features are by no means unique to my surgical rotation – I’ve experienced busyness and fatigue throughout third year. But the mentality of the field is different – in other rotations, working long hours or missing out on stuff happening outside the hospital was a begrudgingly accepted part of training. No one liked it, but it was acknowledged as being a necessary part of becoming a doctor. During this rotation, though, that type of stuff was almost worn as a badge of honor. That’s just not me. I have a lot of respect for those who go into surgery, and I hope this post doesn’t dissuade anyone who truly is meant for that field (I doubt that it would). But for those who are reading this who might already have a family or are planning on starting one soon, I think it’s certainly worth taking a step back before plunging into the field and counting the cost. For some, it may be worth it – and rightly so. The field of surgery is varied and incredible. For those like me, though, who could have a satisfying career in many different areas of medicine, it might be worth thinking twice before committing yourself to that path.